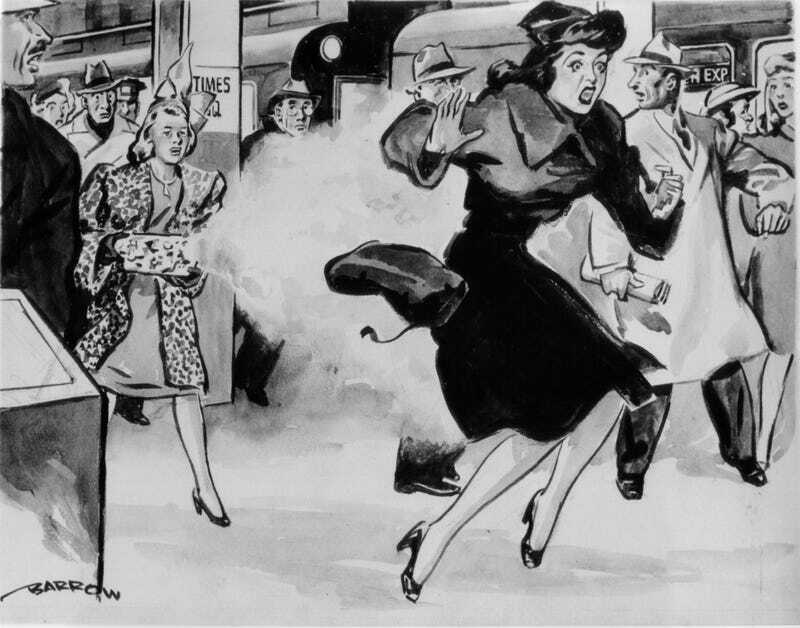 The Tragedy Of The Gangster, The Gullible Girl, And The "Camera Gun"
It was December 1946, and 19-year-old Pearl Lusk was approached by a good-looking man in the Times Square subway station. He was a detective, he told the gullible lass, and he needed her help solving a case. Could she snap a photograph of a suspected thief with this unusual, uh, camera? As the vintage illustration above shows, when Pearl shot the photo, she actually shot the subject, because the camera was actually a gun concealed in a box wrapped like a present. Turns out the woman in question she’d been shadowing wasn’t a jewel thief hiding stolen goods under her clothes, and the man with the camera (that wasn’t a camera) wasn’t a detective. The real story: the target, Olga Trapani Rocco, was the ex-wife of Alphonse Rocco, a gangster. Mr. Rocco spotted Pearl at the station and correctly surmised she’d be able to get much closer to Olga, who was so afraid of her former husband, who’d even shot her before, that she’d asked the police for protection from him. But that wasn’t enough to save her from the unsuspecting girl with the camera gun in the subway, so naive she’s said to have told the cops “I took her picture and at the same time somebody shot her!” when they descended on the crime scene. Olga survived, but she lost a leg. As for Alphonse, he was pursued by the cops to the Catskills, where he died in a shootout trying to escape.